DELAND - Six years ago real estate broker Maggi Hall looked at a decaying neighborhood southeast of downtown DeLand and envisioned renovating the old houses to their former glory, restoring pride to the area. The result - to the surprise and delight of many nearby residents - became known as DeLand's Garden District. 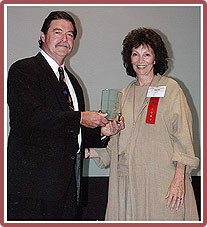 The magnitude of the project so impressed the Florida Trust for Historic Preservation that they gave Hall an award for individual distinguished service during the 2006 statewide annual conference in St. Augustine last month. Hall's was one of three awards given to Volusia County projects during the conference. The Historic Volusia County Courthouse in DeLand and the Tarragona Arch in Daytona Beach each received an award for outstanding achievement in restoration/rehabilitation. "I don't think we've ever given three awards in one county," said Ellen Uguccioni, awards committee chairman. "I've been involved in the awards for quite some time and it seems to me this is a fairly unique circumstance." Hall was recognized for taking the lead on revitalizing a downtown DeLand neighborhood. Most awards to individuals are for one particular residence, Shuttleworth said. "So this is unique, because Maggi's was for general efforts for preservation." The Garden District project "underscored the power of one," Uguccioni said. "We got so inspired when we saw one person take on such an enormous project and make such a difference." Hall and her husband both graduated from Stetson University in 1967. "We both fell in love with DeLand, and vowed we'd come back," Hall said. "It took us 34 years, but we finally did it. So I feel like what I did was just giving back to DeLand for a love affair that began in the 1960s. "The Halls and investor Michael Arth were the first to buy properties in the area. Banks weren't interested. "We had to go to private lenders and pay interest rates of 13 to 17 percent," Hall said. Not until after several houses were fixed up and property started moving did more traditional financing become available. "The really exciting thing was to watch property owners see the houses around them get fixed up, then fix up their own house," she said. So far she's sold more than 50 houses in the district. "There are still a few (blighted) pockets, but they're slowly but surely disappearing." People in DeLand "are in touch with the right values," she said. While the area is changing and growing, the community's core spirit remains intact. "So a concern for other people and for the environment is still prevalent here," she said. "The $8-million Volusia County Courthouse restoration also was inspirational," Uguccioni said. "Renovations began in 1995 on the exterior of the building and were completed in 2002. Interior restorations were completed in November 2005." "So there was completion of the full circle," she said. "It's a very authentic and detailed restoration." A new $45-million courthouse opened in 2001, two blocks away from the 1929 courthouse. "And I don't know that we've ever had a project like the Tarragona Arch," Uguccioni said. The arch, which was built in 1924, stands alongside International Speedway Boulevard and was once part of a pair that served as a gateway to the city. By 2003, the coquina rock structure had weakened to the point the city canceled the tradition of attaching Christmas lights to it. "That (restoration) was the most extraordinary project I've every seen," Uguccioni said. "Those folks went to the ultimate degree to restore what's left of that." The projects were selected by a seven-person awards committee, including members of the Florida Trust, architects, historians, and museum administrators. The committe gave out 24 awards in 10 categories to projects, organizations, and individuals. To receive an award from the organization is "a nice recognition," said Mark Shuttleworth, mayor of Lake Helen and one of two Florida Trust board members from Volusia County. "The process has become much more competitive over the years."